There's probably a reason Act of Valor is being released in February, two months after the window closes for Academy Award nominees and generally the month in which distributors schedule their shittiest movies. The film may be visually interesting, but I have little hope for it being much more than a 120-minute Quicktime event. 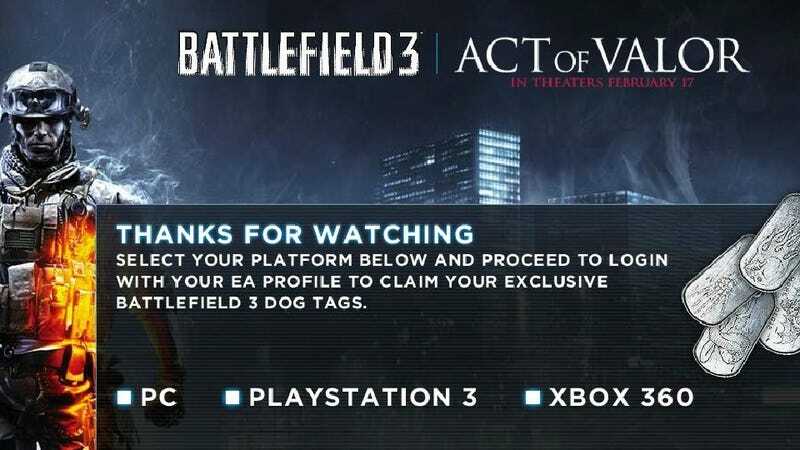 Still, if you go to Battlefield 3's official site and watch the whole thing, you're entitled to a code offering you five unique in-game dogtags. Use them for ... whatever. It's free DLC which, coming from EA, is saying a lot.